Flaming Gorge WFM (formerly Chepeta FUM) is a 10-person, type-1 module formed in 2006 on the Vernal Ranger District of the Ashley National Forest in northeastern Utah. Operating around the principles of excellence, innovation, adaptability, and audacity, Flaming Gorge consistently strives to be one of the best modules in the nation and exceeds the basic qualifications for type-1 modules. To further foster excellence throughout the WFM community, frequently supports detailers from other agencies and programs. Within the module, overhead fully supports the advancement of crewmembers’ S-class training and fire qualifications and encourages individuals to take advantage of the wide range of experiences the module can offer to complete a variety of taskbooks. As a specialized resource, the module is logistically self-sufficient with a full complement of gear to produce a high quality fire management product and live in backcountry conditions. 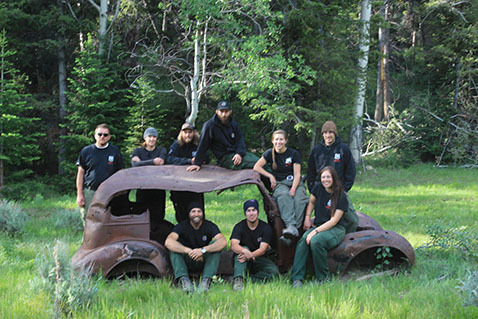 Flaming Gorge WFM supports the management of wildland and resource benefit fires with, not only typical handcrew operations (fireline construction, burnouts, etc. ), but a wide range of monitoring activities, and the specialized equipment and expertise to support these activities. In the field, Flaming Gorge is committed to using cutting edge technology to provide the highest quality fire information, such as weather, fire behavior, smoke, and burn severity data. When not assigned to wildland fire incidents, the module actively participates in fuels management program project work on the Ashley National Forest. Project work consists of common operating picture development, prescribed fire implementation, stand thinning projects, prescribed burn prep work, project monitoring and fuels planning.